On Monday, Jan. 14, the Georgia gubernatorial race came to an end with the swearing in of Governor Brian Kemp. 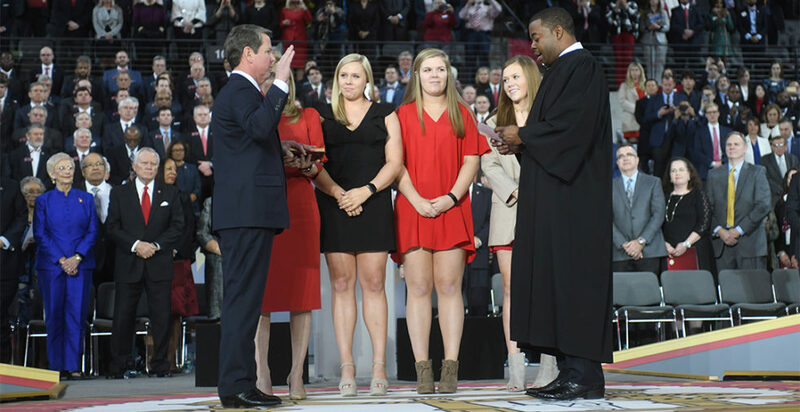 Thousands of Kemp supporters from all over the state of Georgia flocked to Tech’s McCamish Pavilion for the newly appointed governor’s inauguration. Along with Kemp, several other officials were also sworn in, including Lieutenant Governor Geoff Duncan, Attorney General Christopher M. Carr and Secretary of State Brad Raffensperger. David Ralston, a Republican member of the Georgia House of Representatives, addressed the issues brought up by this year’s elections in his introductory speech, stating that “the right to vote is a very cherished right; it is one which we should never take for granted,” prior to the seal of office being handed to Kemp. He promised to work on a wide range of issues, from small businesses struggle to third grade education and rural living conditions, and promised to keep Georgia “moving in the right direction.” His comments were received with a standing ovation. Kemp’s vision includes seeing Georgia become the “Southern capital of the world” through fully funded education, a business friendly government and increased protection for farmers. Despite the earnest support offered by those in the audience to Kemp’s words about a “state united,” the panorama outside of McCamish painted a different picture, where dozens of Tech students gathered in peaceful protest. Despite a run which was defined by partisan politics, Kemp’s inauguration focused on non divisive politics and attempting to bridge the gap the election created between the two major parties. “We have so much in common, and as governor I will fight for all Georgians, not just the ones who voted for me,” Kemp said in closing his speech, promising to work towards uniting the state once again.